Let us start working with structural directives that let us work on HTML element by adding/removing its element dynamically. Sometimes we want the particular set of an element to be visible or render based on some condition and also we want the particular set of the element to render multiple times in the DOM. Let us start working with structural directives that let us work on HTML elements by adding/removing its element dynamically. Sometimes, we want a particular set of elements to be visible or render based on some condition and also, we want it to render multiple times in the DOM. Let us create a sample TestApp. For this, you should have installed the below for the development environment. For creating a new application, run the below command on any of your locations. Once your command is completed, you will have a TestApp folder created inside your sample folder. Now, you will have your project folder called 'TestApp' and your component ‘test’. See my previous article “Getting started with Angular CLI” if you want to learn the installation and introduction from the basics and start with the execution of the sample application. This directive is used to render the particular set of HTML elements on the basis of the condition. Open test.component.html and add the below content. Again, modify the contents as below. Depending on the ngIf condition the element has been rendered above. We can also perform the class business logic to define the condition for which the element will be rendered accordingly. We can create the Else block that will render when the certain if condition will be true. Let us try with a simple example. Element - Under Else block. 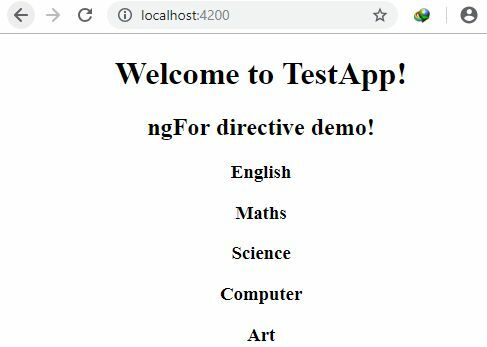 Ng-template in Angular is used to define the block of the elements that we can use somewhere in HTML. Like above, we have utilized this block in else condition of ngIf. Let us use the block of the statement in both the conditions instead of using inline statements. Open test.component.html and add the below contents. Element - Under true/if condition. Element - Under false/else condition. ngSwitch in Angular is similar to other programming switch statements. The only difference is that here we are only rendering the HTML on the basis of the switch statement. It is used when we have multiple sets of value to perform the rendering of a particular HTML statement. Open test.component.html and add below content. The ngFor directive is used in Agular to render the set of elements. It is like the For loop of other programming languages but here it is rendering a list of elements. Let us take an array of elements and render it through ngFor directives in HTML. Open test.component.ts and add the ‘subjects’ array property. You can add the array of objects and render its values in the form of a grid and so on.